JEE Advanced 2019 Application Form: If the Rift between the center and the IITs go to in the favor of IITs, Next year JEE Advanced 2019 will be conducted by one of the seven Zonal IITs on behalf of Joint Admission Board (JAB). The same zonal IIT will release Notification and also the Application form release dates. Till then we can just start our preparation for the exam because most probably the Exam Scheme, pattern and syllabus will be unchanged. With the same hope, we are providing all the details of JEE Advanced Application Form. The application form will be available in the month of May 2019. Candidates get complete JEE Advanced 2019 Schedule through the Official Notification. The Exam is expected to be held within a month after registration. 10th class certificate or birth certificate. 12th or equivalent exam certificates. PIO card or OCI certificate (if required). Category, PwD or DS certificate (if applicable). Application Fee Details are given below. You can Pay the JEE Advanced Application Fee through Online and Offline Mode. Through Online Mode you can pay using the debit/credit card or the SBI bank’s net banking and in Offline mode candidates can pay via SBI e-challan. Now we are Explaining all the steps here. You can follow these step by step procedure to Fill JEE Advanced Form. Open The Official Website and Click on Apply for JEE Advanced 2019. 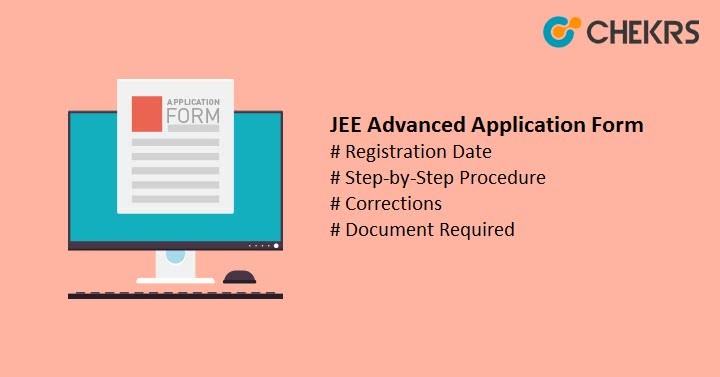 Now Provide Basic Asked Details and Register there, or If you are already registered, Login using the same JEE Advanced Registration Form or login Window by entering JEE 2019 roll number, password and security pin. Choose the new password for JEE Advanced. So through the previous step you have created a new password. After it a new page containing the candidate details provided during the main JEE record will be displayed. Now in it, Mention the number of attempts. Choose 3 test cities and language of the questioned document according to your preferences. Check and Complete category and scribe field. After Filling the form candidates have to upload scanned images and documents. To Do that scan and keep ready your documents in scanned prescribed specifications. And must have the size between 50 KB and 300 KB and in JPG Format. The documents required for registration are already mentioned above. To Upload the image go to the upload images option. And Upload image one by one in relevant place. You Can Pay required Fee after uploading the Required Images. You can Pay the JEE Advanced Application Fee through Online and Offline Mode. Click on “Pay registration fees”. The Multiple Option Payment System (MOPS) page will be opened. In which Enter the payment details and pay the application fee. Click on “Pay the registration fee”. And then take a print of SBI e-challan bank. After it, Send the e-challan to the nearest SBI branch. After confirmation of Registration Fee Payment, Must download and take a print-out of filled JEE Advanced Application Form. That’s It for Today, we hope you all will get all the required details from this Article. Please make sure to fill all details carefully because there will be no JEE Advanced Application Form Correction feature will be available for the next year exam also. After Filling the Application Form You will need information about the Exam which will help you to do all the Preparation. So don’t worry we are here to help you, and already provided JEE Advanced Exam Pattern & JEE Advanced Syllabus in a separate Article. Just take a look and start your Preparation.